The Imece Initiative, a non-governmental organization working mostly with Syrian refugees in the western province of İzmir, has started to provide education for refugee children who do not have access to school, by setting up makeshift tents. As part of the “Makeshift Tent” project, the NGO has been visiting various regions and villages where Syrian agricultural workers mostly live five days of the week, setting up tents in these places. Thanks to the organization’s workshops the children are learning how to read and write in Turkish and Arabic. The NGO has been active for the last three months in the Çamanönü village in İzmir’s Menderes district. About 180 Syrian families live in the village, where greenhouse cultivation has also been initiated intensively. The refugee children wait anxiously every Saturday morning for a bus of the NGO people to come to their village. While some of the NGO workers set up the tents, others dress themselves up as clowns to play with the kids. About 30 children aged between seven and 12 sit around a table set up in a field of olive trees, where two NGO volunteers give Turkish and Arabic language classes. The children have been receiving education in this tent for the last three months and have almost mastered the two languages. Apart from language education, the children are also given mathematics lessons. They have also improved their motor skills thanks to workshops on handcrafts and painting. “Since the kids know that we come every Saturday, they wake up early in the morning and ask their mothers to dress them up in their nicest clothes. When they see us arriving in the village, they come running to us. We have been coming for the last three months and holding workshops for the kids. Every time we come, we see more kids,” Imece Initiative workers said. “Since most of them were born in Turkey, they have never seen a school. First, we conduct painting workshops for the younger children. Later, we give Turkish and mathematics lessons to children aged between seven and 12,” said Ali Güray Yalvaçlı, head of the Imece Initiative Foundation. “To ensure continuity, we are always in contact with the families. For example, a family who is in Menderes this week can be lreocated to the Torbalı district next week. Wherever the kids go, we go there,” he said. We fortunate denizens of the First World may not think about it too much – but there is a dominant culture on Planet Earth. It’s not all about the English language – but that’s a big part of it. It’s not all about the United States of America – but that’s a big part of it too. Clearly science and technology play a major role, as do economics (Wall Street and the Yankee dollar), oil and coffee beans. It’s a worthy aim – and if Perin Gürel’s book “The Limits of Westernization – A Cultural History of America in Turkey” is representative of the series, in my opinion, Columbia Press is on to a good thing. Gürel is Assistant Professor in the Department of American Studies at the University of Notre Dame, Indiana, USA, an American citizen of Turkish parentage. She is balancing the demands of family and motherhood with a promising academic career, and dedicates this, her first book, to her daughter, Marjane Honey: “May you always keep your love of learning and sense of humor entangled.” Amen! Marjane’s mother seems to be managing, so there is hope for the little one. In her acknowledgements, Gürel pays generous tribute to a host of academics, friends and family members who she modestly accepts as co-authors of her book, and pre-empts possible criticism by admitting that this work “impetuously pushes the limits of inter/multidisciplinarity”. For me, that is undoubtedly its main strength. Counting its introduction and postscript, the book’s 200 pages contain six chapters. The essence of Gürel’s thesis relates to the dilemma faced by countries that do not, by birthright, belong to the First World. As the Chinese, Native Americans and the Maori of New Zealand learned, isolating yourself from the dominant culture is not an option. They won’t let you. If you are lucky and sufficiently determined, you may try to find a balance between embracing “modernity”, and preserving the integrity of your native culture. “The Limits of Westernization” discusses aspects of this dilemma using the modern Republic of Turkey as a case study. Gürel is an academic, writing primarily for her academic peers. Nevertheless, she has managed, at the same time, to produce a work that is meaningful and accessible to the non-specialist lay reader – a commendable achievement! In her introduction, Gürel outlines the key problem facing Turkey and other developing countries: the siren attraction of modernity, epitomised in the contemporary world by the United States of America, and the fear that the overpowering dominance of that attraction will subvert and destroy the indigenous culture. The leaders/governments of those developing countries attempt to control and direct the process of modernisation/Westernization – while simultaneously, a wild Westernization beyond their control is inevitably taking place. Chapter One looks at the historical narrative, examining the declining years of the Ottoman Empire and the birth of the modern Republic of Turkey. Gürel discusses the way “history” has been manipulated, in Turkey and the United States, to assist the creation of a national identity. In particular, she focuses on a woman, Halide Edip Adıvar, who seems to exemplify the ambivalence implicit in the emergence of the new Republic. Chapter Two comes at the issue from a literary angle, and deals with the evolution of the novel in Turkish as writers tried to make sense of the rapidly changing social milieu. The key theme is that allegory was an important aspect of earlier Ottoman literature which exponents of the new genre continued to employ in their attempts to shed light on the seismic changes taking place around them. In the third chapter, Gürel leaps into the culturally ambiguous realm of humour. In what is perhaps the most perceptive and, for a Western reader, the most entertaining and eye-opening chapter, she gives an overview of the way humour has played a part in reflecting and moulding Turkish attitudes to foreigners over the centuries. The final chapter deals with issues of sexual identity, in particular contrasting the modern imported concepts of gay-ness/queer-ness, with more traditional attitudes towards sexuality and gender roles. I have to confess, the generation gap kicked in here. I know this is a crucial issue for Millennials. If I were writing the book I might have wound up with a chapter on economics – but there you are. Gürel’s postscript picks up the “Clash of Civilisations” idea popularised by Samuel Huntington. 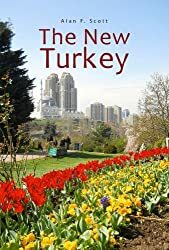 That writer referred to Turkey as a “torn country” – a disparaging term suggesting that Turkey was “fickle” and unable to decide if it wanted to be East or West. Gürel makes the point that “Turkey was never formally colonised”, and consequently had more room to manoeuvre in the process of modernisation. Nevertheless, she notes that, as the “War on Terror” has moved to the forefront of Western politics, Turkey has suffered from a wilful ignorance – a growing belief in Western countries that Turkey cannot be understood, therefore it is useless to try. “That way,” as Shakespeare’s Lear observed, “madness lies.” Full marks to Perin Gürel for showing us another road. “Many people don’t appreciate what they have until losing something or someone. “I really like and admire Recep Tayyip Erdoğan, the President of Turkey. He loves his country. He always tries to do good things and improve the country. He is not afraid to say what he feels – about a person, a topic or anything else. He is clever. He knows how to manage his assistants and the public. When he talks on television or face to face, people feel strong because of his strong personality. “Everyone can make mistakes in their life. We are not perfect – we never have been and never will be. Some people love to criticise everything and everybody. When someone makes a mistake, it doesn’t mean he/she is bad, or an unsuccessful person. The President can make mistakes too. He has many things on his mind: the public, other countries, war, peace, the economy . . . He may not always make the best decision. The important thing is his character. Does he love his country and his people? Does he care about people’s lives? Does he take an interest in every problem? Does he meet and listen to people from every part of the country? Can he answer the questions of other countries? We can ask or compare many things. I’m not a hundred percent sure who said it first – Mark Twain, Benjamin Disraeli or the first Duke of Wellington. Whoever it was, they drew our attention to the sad truth that “facts and figures” can be manipulated, distorted and misinterpreted to prove just about anything. I want to share three items I came across recently, all circulated by people with Turkish names, but seeking to present Turkey in an unfavourable light. Two of them were posted on the business network LinkedIn, and the other, in our local English language news site, Hürriyet Daily News. The first item is a graph purporting to compare the “productivity” of Turkey and China over a 25-year period. The two countries were, allegedly, neck-and-neck in 1990. By 2014, China’s “productivity” had grown exponentially to ten times that of Turkey, which had clearly languished in a state of economic inertia. Well, several questions arose in my mind as I studied the graph. First, what was the source? No sign of that, and the gentleman who posted it online was unable to provide an answer. Second, given that China’s population is twenty times that of Turkey, is it fair to compare their economies in absolute terms, rather than, say per capita GNP? Moreover, is it likely that their “productivity” was equal in 1990? A more serious question, however, is, what, exactly, does the y axis of this graph measure? 500,000 what? 2,000,000 what? Dollars? Automobiles? Chinese noodles? Saudi Arabia’s military budget is three times that of Turkey – though admittedly the Sauds don’t seem to have got much for their money. Israel has 80-200 nuclear warheads (its neighbours have none) and (which the table doesn’t show) an “Iron Dome” (provided at stupendous expense by the United States government) so that no other country can actually attack them. Iran and Egypt both have more active personnel than Turkey, and Egypt also has more aircraft. Syria has more tanks and Iran has more submarines. Of course, Turkey’s military capabilities should not be underestimated, as Britain, France and Greece learned to their cost after the First World War. However, the figures suggest they wouldn’t be wise to start throwing their weight around in the region, even if they did have the inclination. The first thing that struck me is, the global economy is a competitive market, and to be ranked in the top 20 out of 200 is not a bad achievement for a country that was an economic basket-case less than a century ago. Then, once again, the unit of measurement puzzles me. What exactly is “global nominal manufacturing gross value added”? Moreover, let’s take a look at the other economic powerhouses. The United States has lost its Number One ranking, and anyway I’d be interested to know how much of their manufacturing actually takes place on home turf? Australia, the Netherlands and Argentina, in the Top 15 in 1980, had all “dropped out” by 2013. The United Kingdom, Spain and Canada had fallen from fourth, ninth and tenth, to eleventh, fourteenth and fifteenth respectively. On the other hand, South Korea, Russia and Indonesia, out of the running in 1980, had powered up to fifth, ninth and thirteenth places by 2013. So what do we understand from this? One thing is certain, it’s a dog-eat-dog world out there. Do these figures take any account of the proportion of a country’s population living in abject poverty, eg China and India? From a purely subjective point-of-view, the situation in Turkey doesn’t look too bad to me. Without getting into detailed comparisons, levels of air pollution are far below those of China. Destruction of the natural environment by rapacious business interests is nowhere near as bad as in Brazil or Indonesia. In the final analysis, comparisons are odious (not sure who originated that one either) but one other thing is certain, we should treat statistical evidence with caution.